Last Wednesday, I presented a memoir at the the Société de Transports de Montréal’s (STM) consultations on the “Vendôme Access Project”. 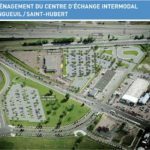 The STM plans to build a second entrance and pedestrian corridor at Vendôme Station, to link together the Metro station, the commuter rail station, the new MUHC hospital, and the residential area to the North of Vendôme. The project will also add elevators, which will finally make the station accessible to people with reduced mobility. Originally, I did not plan to attend these consultations, and hoped that the STM would come up with a reasonably efficient design. However, after seeing the video mockup of the new station, I found the STM’s proposal inefficient and decided to participate after all. The main issue: long-winded transfers that force commuters to take stairs up and down and up again, without any escalators. While very pretty, this image does not represent the actual user experience of most travellers, who do not exit at Vendôme, but instead want to transfer between the AMT and STM trains. Those transferring from buses will not be using this new entrance. In fact, this new édicule will essentially be used by residents East of the station and people with mobility issues who need the elevators. 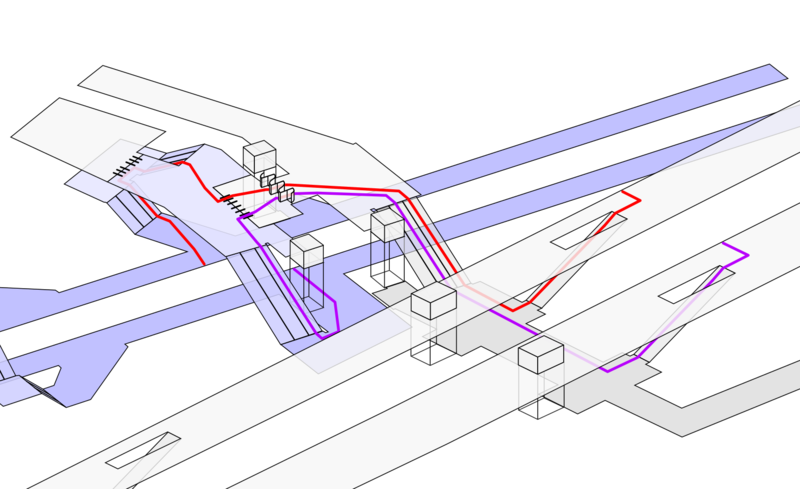 The Planned Vendôme Station, with Eastbound (purple) and Westbound (red) transfer walks shown. A 104m transfer, 3 times the geographical distance between the 2 platforms, stairs totalling 94 steps that make users climb 3 times the actual height between the overground and underground platforms. No escalators, and those who need elevators must take 3 separate elevators along the way. 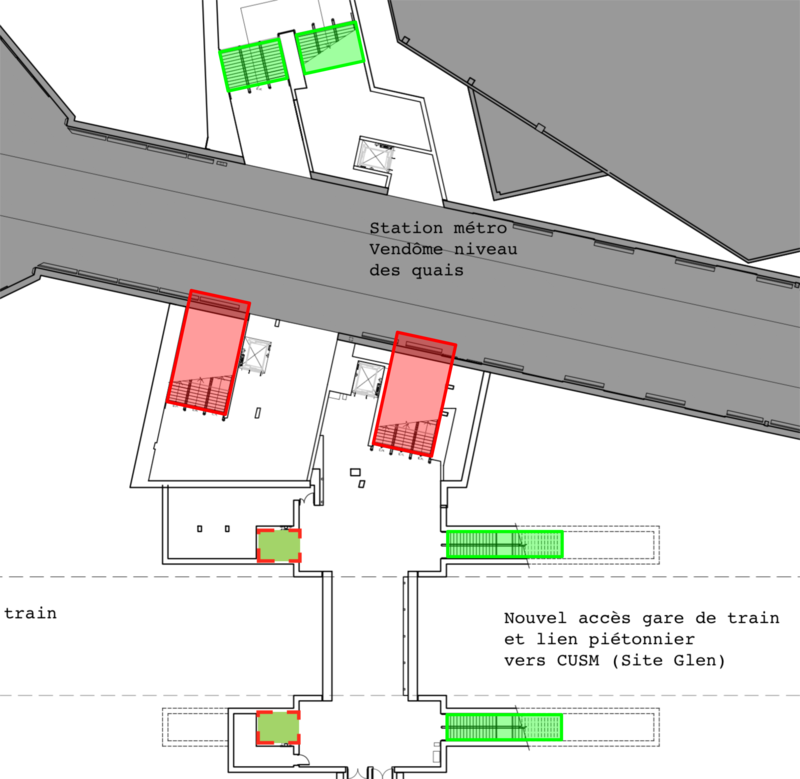 The walking distance is more than the existing concourse at Vendôme, which has a transfer length of 88m to 105m (depending on which platform you are coming from) and ~60 steps. This is surprising given that the physical distance between the platforms is much shorter at the location where the new transfer will be built. One should expect the new concourse to have a shorter transfer! Effectively, the new concourse squanders the opportunity for a shorter, more efficient transfer, made possible by the better positioning along the platforms, by instead providing a transfer-walk which is worse than the existing one! And this matters, because people really hate wasting time in transfers. Transit agencies consider the psychological penalty of transferring to be more than two times the actual time it takes for the transfer. The problems are exacerbated by the many long flights of stairs, which require more time and effort. In the end, when users have to choose between taking the car or the train, these extra minutes during the most inconvenient time of the commute may tip the scale and result in many people choosing driving over transit. Vendôme is an important transfer point between the Orange line and 3 commuter rail lines. These lines form the “CP division” of the commuter rail network. While these 3 lines see about 33,700 passengers per day, the infrastructure is very much underutilized. This is largely due to the limited number of trains (low frequency), more expensive fares compared to the STM, and lack of stations in NDG (between Montreal-Ouest and Vendôme). The CP line passes through one of the densest areas of Montreal that is not served by rapid transit. Several bus lines running parallel to the corridor have more ridership than the commuter rail lines, so the demand is clearly there. Population density near the transit network centered around Vendôme station (source: 2011 census). The area in NDG is one of the densest areas of Montreal not already served by rapid transit. 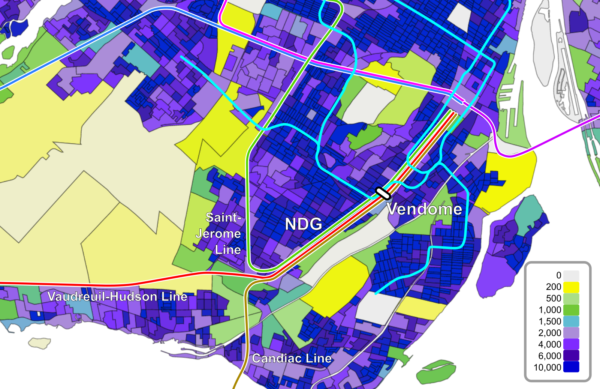 At the same time, Vendôme sits in the corridor that is the main access point downtown from the West of Montreal, and there have been multiple proposals to connect various areas using this line. If utilized better, this line could easily triple its ridership. Still, the rail line has one major issue: the quality of the connection downtown. The terminal station is Lucien l’Allier (built when access to Gare Windsor was cut off by the construction of the Bell Centre). It is located downtown, but the walking distance to many work places is rather long. 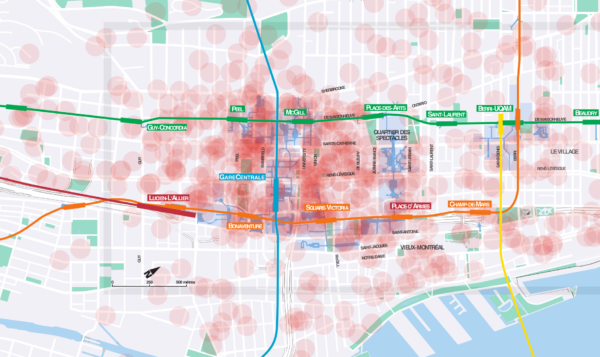 Work places in Eastern downtown can not be reasonably reached by walking — commuters will have to use the metro to reach them. Lucien l’Allier (red, centre-left), compared to the places of work in downtown. Every red circle represents 500 workplaces (source: 2006 census). Note that Lucien l’Allier also has a connection to the metro. 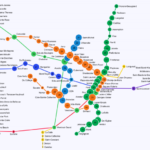 But this transfer is rather long, because of the distance between the metro and AMT station locations and the depth of the metro station. Vendôme station is therefore the most important transfer to connect the AMT CP division to downtown. How Could We Fix The Proposed Design? 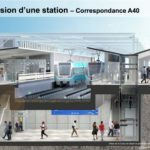 Thanks to a question during the information session by Matthew MacLaughlin, who runs metrodemontreal.com, the STM was asked to provide plans for the new station. Starting with those as a template, it’s possible to analyze the “constraints” that were often mentioned during the question session, when people asked about the inefficient design. If we look at the proposed connection, we see that inside the green area highlighted in the below image, the paid Metro area (blue) and the AMT tunnel (grey) almost touch. But since these areas are not connected, passengers are forced on a detour up and down stairs, just to get on the other side of a wall. Again, you see the paid Metro area on the left (highlighted blue) and the AMT area on the right (highlighted grey), separated only by a wall. At the information session, the STM claimed that the AMT and STM areas don’t have exactly the same floor height — but the plans they provided do not show that. In fact it appears that people transferring from the Metro will have to walk up 31 steps on the right, then down 31 steps on the left, meaning the floor heights should be the same. Any difference should be minimal, and the floor height of the AMT tunnel could easily be adjusted to match the Metro platform. 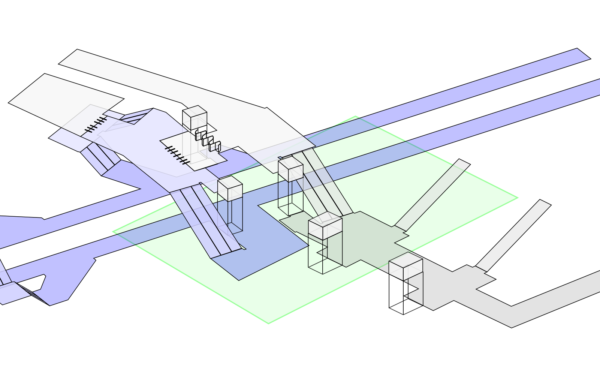 Here, I simply added doors between the AMT and the STM area. The heavy turning doors are required because the STM needs a closed system for ventilation purposes. Note also that I removed one set of stairs on the left, and one elevator, because they have now become redundant — people coming from the left can use the stairs and the elevator on the right. Note also the added turnstiles, which passengers have to pass through to get to the metro platform. One of the quirks of the proposed design is that the station is divided into two completely separated areas: one with a paid fare area for the STM (with its own ventilation) and one for the AMT, which uses proof-of-payment and different ventilation. This is very strange, given the constrained space. Basically, the planners of the Vendôme Access Project beautifully created a large amount of space by taking it from the adjacent bus loop and building. They then filled the space with all sorts of infrastructure, dividing it and making the space cramped and hard to use. It also means the AMT area does not benefit from the large window facade. 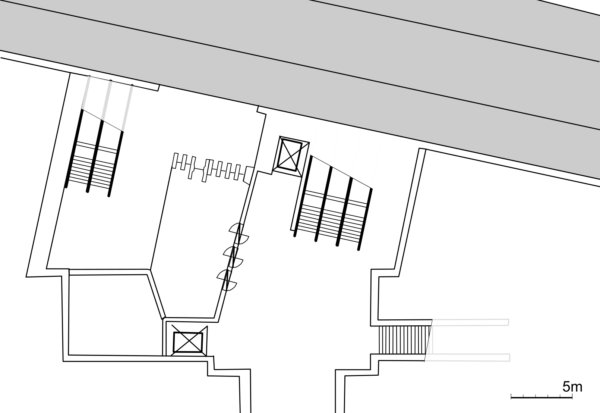 But it would be possible to have a shared concourse, by placing the whole station under STM ventilation and having turnstiles closer to the platform. This is done like this for example at station Bonaventure. 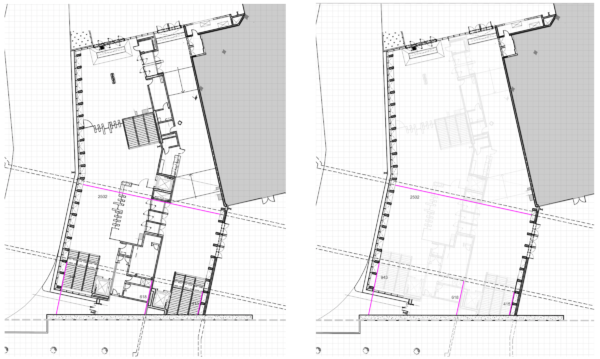 Current plan vs current plan removing all the walls inside the proposed edicule. 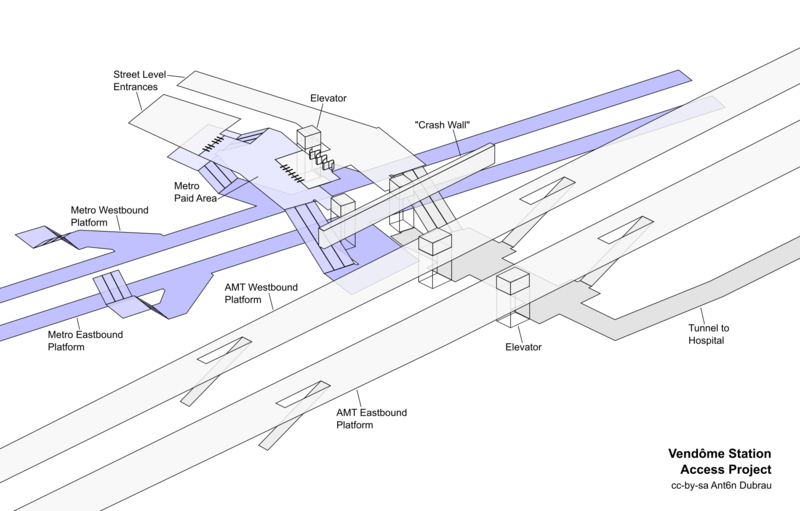 In the diagram above, we see that by opening up the space, we can now have two connections between the metro platform and the AMT tunnel, reducing walking distance along the platform to reach the tunnel. Profile of current plans, with escalator envelope superimposed, showing conflict. 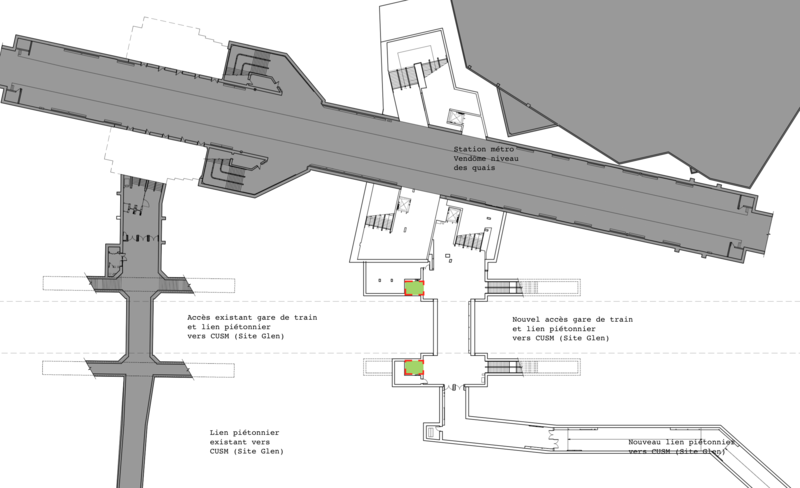 As you can see, the “machine room” of the escalator would conflict with the existing metro tunnel. But this problem exists only at this one spot; the various other stairs don’t have that problem! 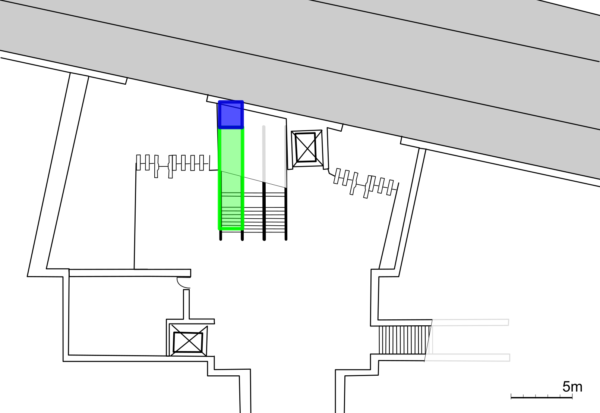 Stairs with clearance issues shown in red, stairs that should not have escalator clearance issues are shown in green. 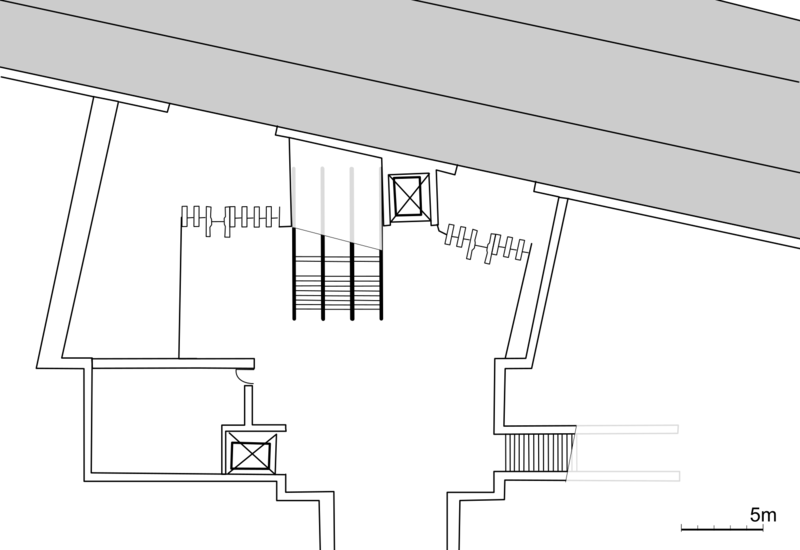 And even for this one critical set of stairs, it would be possible to add escalators if we lowered the floor above the metro tunnel and move the stairs Westward, which will provide more clearance under that “crash-wall”. 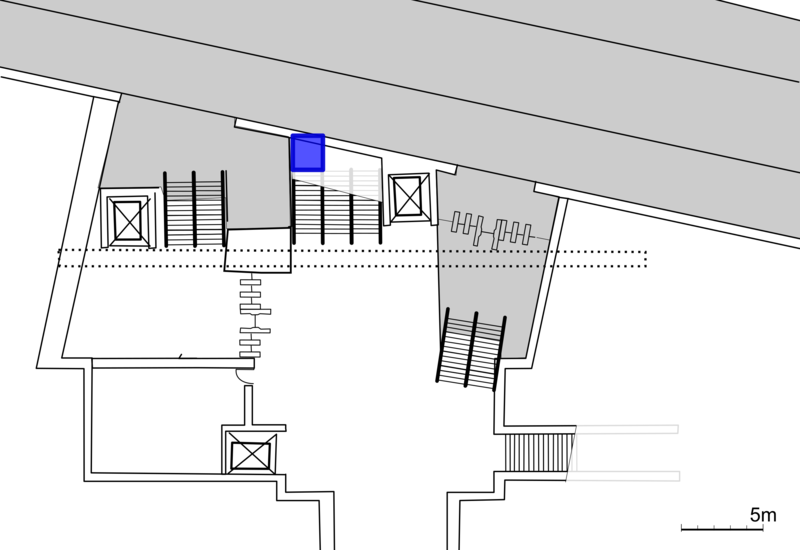 with enough 2m clearance (shown in blue) between the Metro tunnel and the escalator. The design so far has reduced the length of the transfer between the Southern metro platform and the AMT concourse from more than 100m to about 40m. To make an impact in the other direction, i.e. 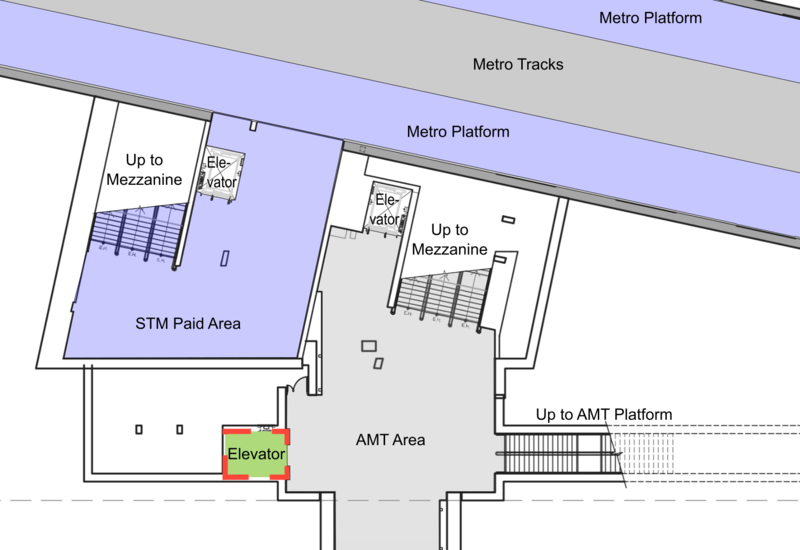 the transfer between the Northern (Westbound) metro platform and the AMT trains, we should try to remove the total number of stairs. long flights of stairs will be turned into several shorter flights of stairs, which require less effort. In an ideal world, the Metro tunnel should have been built lower or the AMT tracks raised at some point, so we could have a single mezzanine strategically placed between the Metro and the commuter rail platforms. Building this now would involve such a large impact on the existing infrastructure that it would be too optimistic to propose. The ideal solution: a single mezzanine between Metro and commuter train. 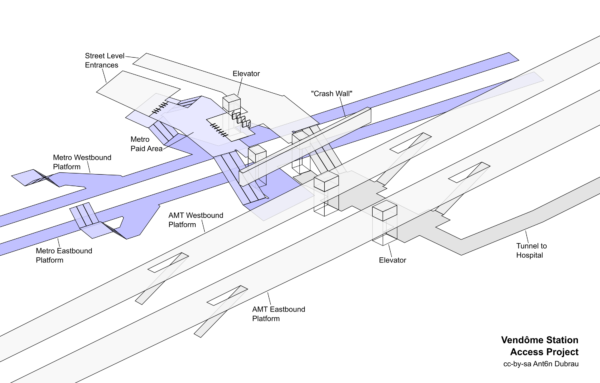 However, without making major changes to the existing construction, we could still maximize the floor level of the AMT concourse by using a very low height for the tunnel (2.20m), and a very low profile rail bridge. the horizontal features are approximate. The boxes represent elevators. At the STM level. The white areas represent areas that are at the AMT level. 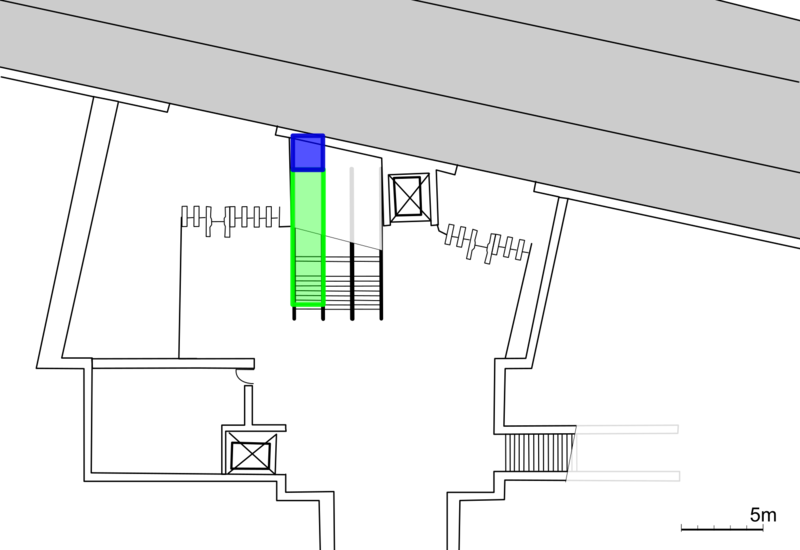 The blue area represents the vertical clearance required for an escalator. The dotted bar is the crash wall (all elevators have to be North of it). The above design can easily deal with any separation between the STM and AMT level, up to about 2.5m — as long as a single, shared concourse is used between AMT and STM. 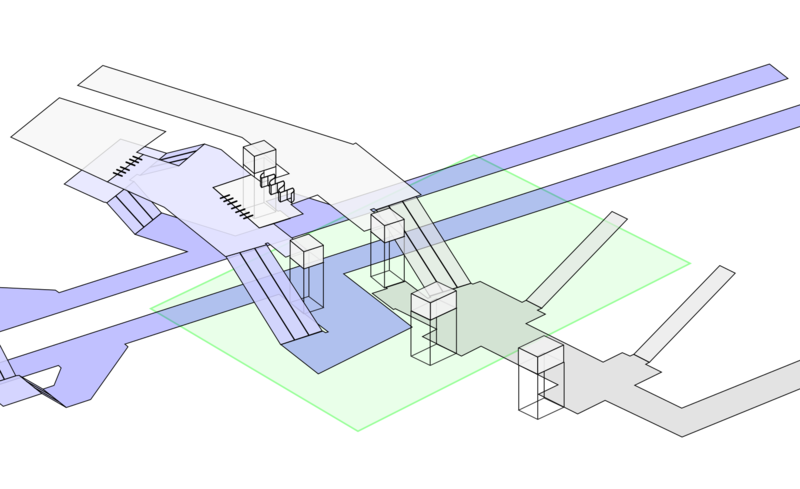 Note the efficient use of the available space, the insertion of elevators in the constrained space between the “crash wall” (dotted line) and the existing metro tunnel, and the arrangement that allows adding an escalator for every set of stairs. So using a single, shared concourse between AMT and STM, rather than two separated turf areas, together with some optimizations, we can significantly improve the transfer experience for tens of thousands of passengers. Conclusion: Participate in the Consultations and Demand Improvements! I believe my presentation has at least piqued the interest of the Commission (the president thanked me for the “well-researched and thoroughly thought-out presentation” and another wondered whether I was an architect). After my presentation, I also spoke with attendees who seemed interested in the ideas I put forward. This consultation has convinced me of the importance for people to voice their opinions. For this project, many people asked questions about the inefficient design and the lack of escalators at the initial information sessions. But at the session where the public may make presentations, nobody besides me talked about these issues — so although the independent commission was aware of the problems, if nobody had come and complained about them, they couldn’t mention those in their report. It was my impression that the Commissioners were glad to have someone there who talked about station design. Projects like these are often “designed by committee”, and the public isn’t directly involved. It’s only during the consultations, even if they are non-binding like this one, that we get a chance to “pull up a chair” and participate, and ask for improvements for users. This time, one person showed up and entered concerns into the record, so there is a slight chance that improvements may happen. This chance increases with every voice that is added to the chorus. Participation is important, there may be nobody doing it for you. See video of my presentation here, and read my brief here. That’s a really well thought out article. I hadn’t considered how NDG could be served by new stations West of Vendôme (and perhaps one in Westmount too?). It would make a big difference to people living there to have an alternative to the woefully overcrowded buses that run through that area during rush hour. There’s an opportunity for Vendôme to become a useful transport hub in the West, if they get it right. There is a pedestrian overpass that connects De Maisonneuve to St-Jaques. This would be a perfect place for a stop in between Montreal-West and Vendome. There’s no reason why that corridor shouldn’t be upgraded to frequent service, the 105 and 51 have tens of thousands of riders. Thank you for the work and paying attention! Nice work! Hope they pay attention and avoid the mistake. Incroyable, on croirait qu’il se sont inspiré de la correspondance entre Bonaventure et la gare Centrale. Ils font comme si c’était deux stations complètement séparées. En tout cas félicitations, je n’ai jamais lu d’articles aussi clairs et aussi complets que les vôtres sur les transports. Great post! Hopefully this leads to a design change. Thank you for this thorough research. Anton, wonderful analysis and recommendations. I hope that the powers that be have open minds to “outside” ideas; your designs are far superior to theirs. Thank you for your hard work. Anton, your proposals are very well thought out. Your grasp of the project from both a structural and user/human perspective is first-rate. I do have one concern, though. 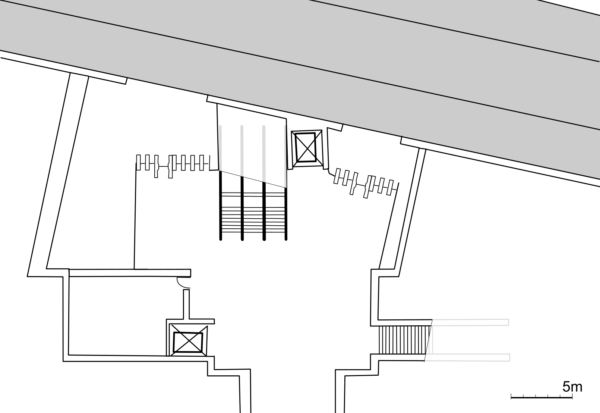 In your Proposal 3, I wonder about the raised tunnel floor height beneath the AMT tracks, and if perhaps there’s a structural reason why the STM/AMT design could be necessary. I am not an engineer. Maybe. I think they should maybe pick a different construction method, and think about adding the fourth track at Vendome (allowing more flexibility in choosing construction methods). Nevertheless, the tunnel sections to be inserted should be prefabricated tunnel sections, which can probably have extremely low cleareance, and can probably be inserted over the weekend. At the same time, the tunnel height appears to be around 3.5m. So It’s possible to raise the floor of the tunnel by 1m easily by just raising the floor, without changing anything about the heavy engineering.